The cross breeding of the Toy Poodle (or Miniature Poodle) and the Yorkshire Terrier has as a result a mixed breed called Yorkipoo, who’s more often a friendly, adorable and quite the smart dog. 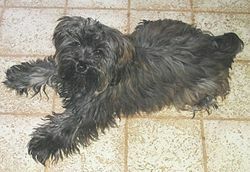 Sometimes, this dog is obtained by crossing two Yorkipoo already crossed parents. The ideal home is the one who doesn’t have very young children, due to its reduced stature and, therefore, frailty. The strategy that was applied when crossing the two breeds aims to combine the Poodle’s traits such as intelligence, low shedding coat and high trainability with the boldness of the Yorkshire Terrier and, at the same time, reducing the impact of the independent behavior and stubbornness displayed by the Yorkie. 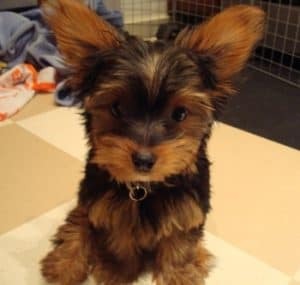 When the practice matches the theory and the best scenario is achieved, the Yorkiepoos are people oriented dogs, with a friendly nature and propensity to training, while also being adorable and playful, especially when they are puppies. If the Yorkipoo comes from a breeder who treated the breeding irresponsibly and did not take all the necessary health precautions, this breed can be a mix of genetic issues passed on from the parent breeds, such as tyrant-like behavior, noisy and snappy personality, as well as some serious health problems. Yorkipoos inherit some boldness from the Yorkie which, combined with their reduced size, can lead to some foolish acts towards other bigger dogs, which makes the leash a good solution. At the same time, it’s best to keep an eye on them when they’re in the proximity of small children, as their enthusiasm for animals can lead to some rough petting or playing which might hurt them. 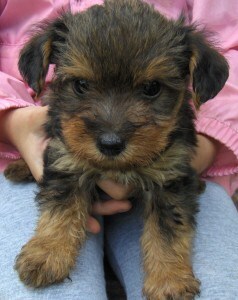 The Yorkipoos are for indoor keeping, within a loving family, as they are not happy at all if kept outdoors. The ideal scenario or at least what most people want in a Yorkipoo is to combine the trainability and fun of the Poodle with the Yorkie’s boldness, but a bit more tempered rather than too aggressive. However there are also chances for this friendly version to be replaced by a combination of traits a bit more undesirable from both parent breeds. Yorkipoos are dogs that feel most comfortable indoors, but they need not to be left on their own entirely, as their playfulness and mischievous behavior can turn them into a slightly destructive and noisy presence. Otherwise, he is pretty much fun. Please bear in mind that he tends to be the barker kind. With regards to the health of the Yorkipoo, the first goal is to target a reputable breeder to get your puppy from, as they are preoccupied with breeding healthy specimens, while also being honest with potential future owners about the perils of this breed. 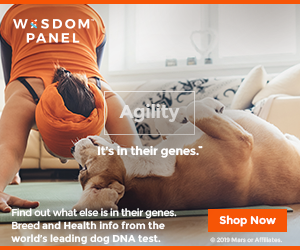 While there are chances that a cross breed to inherit fewer health weaknesses than the parent breeds, there is also the chance for it to be exposed to issues from both sides. Genes in general are, however, unpredictable in most cases and there is no guarantee which of these two situations will actually happen. It is best that any person interested in getting a Yorkipoo should carefully study the health guides for both Miniature Poodle and Yorkshire Terrier breeds. A Yorkipoo’s coat can be either scruffy or curly, which will also indicate the level and frequency of the grooming required. However, it’s no secret that daily brushing is ideal no matter which type of coat the Yorkipoo has. Although some owners prefer to carry out the grooming by themselves, professional groomers are very useful and even needed sometimes. No matter who carries out the coat grooming, it needs to be properly done so that no skin and hair roots infection occur underneath a filthy, matted coat. The next thing to be considered for grooming activities are the ears, which need to be kept dry and clean as much as possible in order to prevent the forming of the wax. The nails require trimming generally every two weeks. The teeth also need to be brushed frequently with veterinarian approved toothpaste in order to ensure breath freshness and a high level of oral hygiene. In order to get the most suitable Yorkipoo puppy according to your needs and desires, locating good, reputable breeders is absolutely necessary, as they will guide you to the puppy you want and, moreover, they would have taken all the health precautions so that the puppy will live a healthy, happy life. For this kind of breeders, getting their puppies in the perfect homes comes first, not the money. They will always try to inform any potential future owner about all the aspects in the Yorkipoo’s life that require attention, along with the health history of both parent breeds. Some of them will even evaluate you to make sure that you are the best option for the young puppy as well.